Reference Information - CD 113 Hemingray > Script and stamped used in the same year, different molds. Script and stamped used in the same year, different molds. Mold 4-41::.=1946- is entirely script embossing EXCEPT for the number 12 which is stamp embossed(the number 1 on the rear side is also script and not stamped). This is the RH set of images in the collage. The LH set is mold 8-41::.=1946- but is embossed entirely with script embossing. 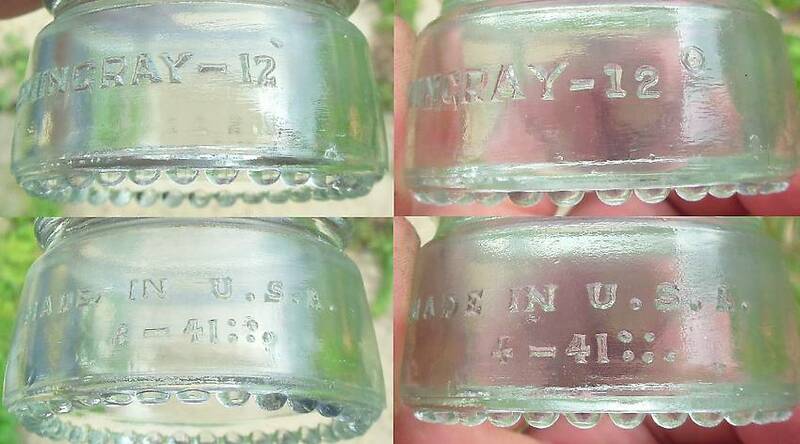 This proves that stamped embossing punches DID exist to be used in the 1941 molds(or at least the numbers 1-2 existed). But why would they mostly use script and mix both embossing types when they had stamped punches, and ONLY for the 1941 manufacture year molds?? ?